Bluetooth module HC 05 interfacing with pic microcontroller: Hi Everyone, In this article I will explain you how to interface Bluetooth module HC 05 with pic16f877a microcontroller or any other microcontroller like 8051, AVR and Arduino. It is very easy to communicate with android mobile through Hc 05 Bluetooth module. It has many applications and this Bluetooth module Hc 05 is very popular in engineering students. Many students use this module in their microcontroller based projects. Examples of most popular Bluetooth based project are robot control through android mobile and home automation system. You can also use it to measure solar energy on your sell phone through android application. So lets start with basic introduction of Bluetooth module Hc 05. It has single chip on board integrated circuit based on CMOS technology.It has upto +4dBm transmission power.It has wide operating voltages between 3.6 to 6 volt. Default baud rate of this device is 9600. But you can change it according to your requirement by using AT commands. I will explain later how to use AT commands of this bluetooth module. HC 05 work on serial communication. It communicates with microcontroller through UART communication. So you should know how to use serial communication of pic microcontroller. If you know serial communication programming of pic16f877a controller you can easily interface this module and write a program in C.
pin out of Hc 05 module is given below. KEY pin: This pin is used to enter AT commands. If this pin is connected with ground or no connection, you can simply use it pair it with devices. if it is connected with high logic, it will use to enter in AT commands.This pin is used to remove information stored in hc 05 bluetooth module about paired devices. State pin: It is of no use. It just shows the status of device. Vcc pin: It is a power supply pin. You should connect 5 volt with this pin. Ground pin: Connect ground pin of power supply to this pin. TXD pin: This is data transmission pin. You should connect RXD pin of microcontroller with this pin. RXD pin: This is data receiver pin from microcontroller. you should connect TXD pin of microcontroller with this pin. 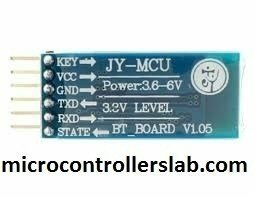 In above we have simply connected RXD pin of microcontroller with TXD pin of Hc 05 BT module and TXD pin of microcontroller with RXD pin of HC 05 BT module. When you turn on BT module by providing power supply to it, it will become searchable by other BT devices. For example with your android mobile you can search for available devices. It will be available with the name of HC 05. Now you can pair with it. When you try to pair with Bluetooth module Hc 05 first time, you will have to enter a password. Default password for this device is 1234. You can also change the password by using AT commands of this module. Once you are done with pairing of your mobile with hc 05 BT module . Now you can send and receive data from android mobile to BT module through microcontroller and vice versa. you can install any Bluetooth terminal app on your android mobile to send and receive data. you can try this android BT device. Below is a video in which I explain how to interface it with pic microcontroller and how to use to control LED’s connected with microcontroller. 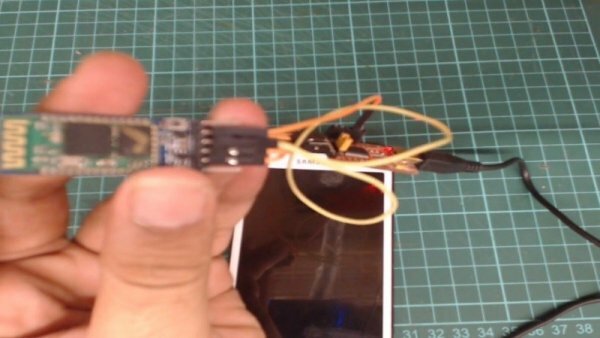 Below is video lecture on how to measure solar energy on android app using microcontroller and HC 05 Bluetooth module. In this project, I have measured solar energy with pic microcontroller and send it to android app using BT module.